If you're curious why a Vitamin D3 deficiency is being discussed on a website primarily devoted to reading instruction, you might be interested in The Diet Piece of the Dyslexia Puzzle. How Is Vitamin D3 Different than Vitamin D? Vitamin D3, commonly known as the "sunshine vitamin," is cholecalciferol (coal’-i-kal-si’-fer-ul). It is either manufactured by the skin from sunlight (or the right tanning lamp) or provided as either a supplement or, modestly, by diet. The relationship between cholecalciferol, calcidiol and calcitriol can be confusing Cholecalciferol is converted by the liver into a pre-hormone called Calcidiol (cal-si-die’-ol) that is then stored for use by various organs in the body. This is the substance that you want to obtain a measurement of when you order a Vitamin D3 test. The proper test is called 25(OH)D and measures the blood level of Calcidiol. The test name comes from its chemical name, 25-hydroxyvitamin D.
Calcitriol (cal-si’-tree-ol) is a hormone manufactured from Calcidiol body stores. It is known as activated vitamin D and is measured by a test called 1,25(OH)D (from it's chemical name, 1,25-dihydroxyvitamin D.) The reason this test is not meaningful for our purposes is that the kidneys will first use as much calcidiol from the body stores as is necessary to get calcitriol levels in the blood raised to the level necessary for maintenance of blood calcium levels. After the kidney has used whatever calcidiol it needs to maintain proper blood calcium levels, then the remaining calcidiol body stores are available be used by other organs in the body. If one is deficient in calcidiol, the blood level of calcitriol might still be within normal ranges, as it is produced first because sufficient blood levels of calcitriol are necessary to maintain essential levels of blood calcium. For our purposes, we are concerned with how much calcidiol is still available after the kidney has taken its share. What is the Blood Test for Vitamin D3 Called? As explained above, if you're concerned about a Vitamin D deficiency, you want the 25(OH)D test to measure the calcidiol level. The blood test designated 1,25(OH)D will not tell you what the body stores of calcidiol are, but it is the test sometimes ordered when you ask your physician for a vitamin D test. Be specific when you request the test that you want to test vitamin D3, not just vitamin D.
What Level of Vitamin D3 is Being Recommended to Avoid a Vitamin D Deficiency? The vitamin D3 research community has generally agreed that an individual should seek to maintain a level between 40 and 60 ng/ml, with a few researchers advocating an upper range as high as 80 ng/ml to get the full benefits of the vitamin D3 system. Also, be careful when you interpret the test result. In the U.S., the number will be reported as nanograms per milliliter, or ng/ml. In Canada, and some other countries, the test result is reported in nanomoles per liter, or nmol/L, a number that is 2.5 times ng/ml, so the 40 to 60 ng/ml levels correspond to 100 to 150 nmol/L. Make sure you are aware which units are being used when you interpret your test result. If your doctor says you're at 50 nmol/L, and you think you're in the recommended 40 to 60 ng/ml range, you'll actually be very low at only 20 ng/ml. What is the Vitamin D3 Dosage Required to Reach the 40 to 60 ng/ml Range? That's where it gets tricky. Everyone starts at different starting points, reacts differently to sunshine, has different body sizes, different skin pigmentation, etc., so it's advisable to be do regular testing if one is supplementing with vitamin D3. 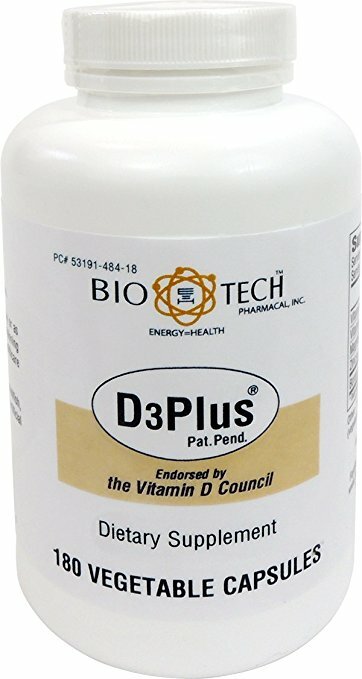 Bio Tech D3Plus at Amazon BioTech's D3Plus contains several cofactors believed to aid the absorption of vitamin D3, although addition of the cofactors does add to the cost. One capsule provides 2,500 IU of D3. It probably makes the most sense to test at least twice a year for a time, at the end of winter, and again at the end of summer, so that one can determine how much vitamin D3 is manufactured by summer sun exposure, and how much is needed during winter to maintain any particular level. Can I Address a Vitamin D Deficiency Without Taking a Supplement? Actually, many of the vitamin D3 researchers recommend getting vitamin D3 either from the sun or from a tanning bed that provides the proper part of the ultraviolet light spectrum. This is because the skin has a mechanism whereby it stops making vitamin D3 after a certain point and actually starts destroying it just as fast as it's making it, so it's impossible to build D3 to toxic levels. Note, however, that their advice conflicts with other medical advice to avoid direct exposure to sunlight (and tanning beds) so it creates something of a quandry. You have to decide whether to ignore the dermatologist's advice and go with sunshine, or go with supplementation. You just aren't likely to be able to accomplish much with diet alone. Our bodies really are structured to get most of our vitamin D3 stores from the sun. By the way, lamps for treating Seasonal Affective Disorder (SAD) usually filter out the UVB rays that enable your body to make vitamin D3, so they will not suffice. What's the Government Got to Say about Vitamin D3 Supplementation? In 1997 the Food and Nutrition Board and the Institute of Medicine (FNB/IOM), responsible for setting dietary intake recommendations, declined to establish a Recommended Daily Amount (RDA) but instead declared that a daily Adequate Intake (AI) of Vitamin D would be 200 IU for infants to 50 year olds, 400 IU for 51-70 year olds and 600 IU for those 71 and older. At that time they also declared a tolerable Upper Limit (UL) , a presumably safe upper limit for intake of Vitamin D, to be 1000 IU for children under one year old and 2000 IU for all other children and adults. In 2010, the Tolerable Upper Limit for adults was doubled to 4,000 IU per day Then, in November of 2010 that same board doubled the tolerable Upper Limit for adults to 4,000 and raised their other recommended levels as well. Because researchers feel constrained by these limits, the doubling of the maximum to 4,000 IU will now permit some serious testing to be done at levels that should prove therapeutic if vitamin D3 behaves as its advocates claim. Also, vitamin manufacturers have felt constrained by the Adequate Intake recommendation so you usually find only 400 IU in a multi-vitamin. That, too, will gradually change as government recommendations change. How does Vitamin A Affect Vitamin D3 Supplementation? Dr. John Cannell is the lead author (of a total of 17 co-authors) on a paper published in 2008 titled Cod Liver Oil, Vitamin A Toxicity, Frequent Respiratory Infections, and the Vitamin D Deficiency Epidemic. In that paper, the authors argue that supplementation with Vitamin A in the form of retinols (as opposed to carotenoids found in vegetables) will frustrate the body’s ability to efficiently utilize the Vitamin D3 (calcidiol) stores. He advocates providing needed Vitamin A in the manner nature intended, by eating the right vegetables, so that the body can regulate the needed amounts of Vitamin A on its own. At least this is how I understand his discussion. This could be important because autistic children are often supplemented with Vitamin A (if website discussion topics are a decent indication) and Dr. Cannell (and 16 other authors) are claiming that it is important not to override the Vitamin D3 processes by supplementing Vitamin A in retinol form. Cod liver oil, for instance, provides Vitamin A in retinol form. How Much is Treating a Vitamin D Deficiency Going to Cost? Literally pennies a day per person in your family. No one is going to get rich selling vitamin D3 in the form of cholecalciferol. 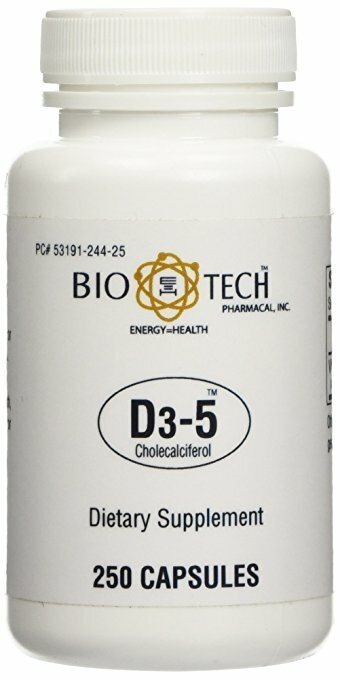 Bio Tech D3 (5,000 IU) at Amazon Here is a 250-day supply at a cost of a nickel a day when originally posted in 2017. Note that 5,000 IU per day might be too large a dosage, especially for a child. 1000 IU capsules are also available. On the next two pages you'll find a discussion of two excellent studies, one on fish oil and the other on supplementation with a multi-vitamin, that indicate that nutrition can have a direct impact on certain facets of reading ability. Note: The multi-vitamin study should not be considered an endorsement of a multi-vitamin. However, some component(s) of the administered vitamin appeared to have an effect. Why is a Vitamin D Deficiency Being Discussed on a Reading Website? And, finally, if you do have a child who is struggling with reading, be sure to also read The Vision Piece of the Dyslexia Puzzle. You might also want to check out the main reason for this site's existence, the OnTrack Reading Phonics Program.